Like many things in life, fitness is a journey not a destination. Hence, the announcement of this much anticipated result for this challenge between Tiffany and I is a personal commitment to stay healthy and keep fit irregardless who wins the Fit Right In challenge. During the last session of my personal training with Jensen, there was another lady who was also undergoing physical training with another trainer. Throughout the entire workout, she was complaining that the tasks were too difficult and negotiating with the male trainer to do lesser repetitions. When the going gets tough, only the tough gets going. Tough times don’t last, tough people do. Choose what kind of person you are. I guess I can give many excuses and legitimate reason such as my wrist injury but I trust my personal trainer to know when to push me and when to give a hi-5 to encourage me. The much await result.. 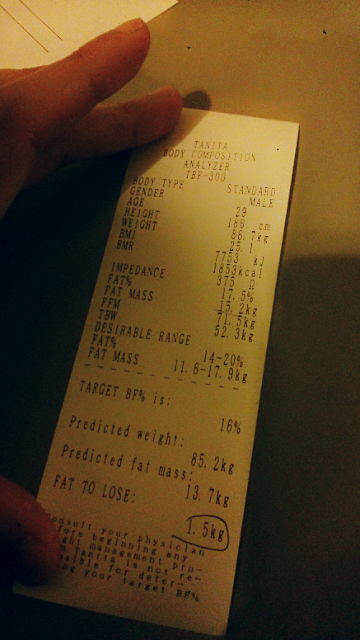 I lost a total of 3 kg within just 3 weeks of personal training at Physical ABuse. This is a result of hardwork at the gym and also diet control. During this period, I workout minimum of 2 times a week, combing weight training with group workout classes. For diet, I cut down on rice, bread and other simple carbohydrate. For dinner, I usually will have fish soup or high fibre fruits. But procrastination and lack of discipline are my main weaknesses which is why I’m considering to sign up with additional personal training after my wrist is healed. After all the results prove for itself and if I can get the dream physique in a shorter time, I don’t mind investing in improving my image. Perhaps, you should also start with 4 sessions of physical training and unlimited gym access and group fitness class through Physical ABuse’s Fit Right In package. This entry was posted in Annoucement, Daily life, Health and Fitness, Singapore and tagged affordable gym in singapore, fit right in, get fit, gym in central, gym in central singapore, gym in singapore, gym in town, gym trial, gym with good location, gym workout, physical abuse, physical abuse fitness center, physical abuse fitness centre, physical abuse gym, physical abuse gym singapore. Bookmark the permalink. It’s $10,000 at stake and a whole load of ramen! about this, what if you composed a catchier post title? added something that makes people want more? I mean Fit.Right.In – The Challenge Result | Malcolm Sunny is kinda vanilla. grab people to click. You might add a video or a pic or two to grab people interested about everything’ve written. In my opinion, it could bring your posts a little livelier.